This week’s Writer Wisdom quote comes courtesy of Live.Read.Write and Susan Goldsmith Wooldridge’s Poemcrazy. Look for this week’s #WeeklyWriterWisdom questions after the jump. Last week was the launch of this year’s 8th blogoversary “party,” with a giveaway featuring ten unique fiction books I highly recommend. (Sunday, July 9th was the actual blogoversary.) Today, it’s time for conclude the celebration… with two more giveaways! And since both prizes are writing-related, I’m calling them the Writerly Wisdom giveaways, after my semi-weekly Writer Wisdom quote series. So which books are options for the first giveaway? (Hint: Check out the banner image above.) What did I find so enriching or inspiring about each one? And, what is the mysterious second giveaway? Read on to find out! I still have some catching up to do in the Blog Awards Department. 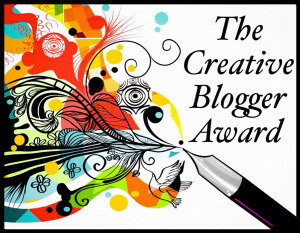 So, for this month’s 5 on the 5th, I’m combining it with *finally* accepting Elizabeth Rawls’ nomination for the Creative Blogger Award. Thank you again, E., and I’m sorry it’s taken so long for me to get to this! Thank the blogger who nominated you and post the link of said blog. Share five facts about yourself to your readers. Nominate 15 to 20 blogs and notify all nominees via their social media or blogs. As you can probably tell from the title of this post, I’ve put a “creative” spin on accepting this award. 😉 Instead of five random facts, I’m recommending five books on the craft of writing. And with Christmas and other gift-giving holidays around the corner, there’s no better time to find new reference books for the writer in your life – or for yourself! Btw, the following books are for all writers. I may do a separate 5 on the 5th in the future specifically on reference / craft books for speculative fiction writers.